Andrew Luck is 7-0 in the NFL following a loss. Ladies and gentlemen those numbers are not Peyton Manning’s stat lines for the past two weeks. No, the above numbers represent The Informer and “The Question’s” NFL picks challenge records. As you can see this year’s picks have been catastrophically bad. For The Informer, after three straight years of picking over 52-percent against the spread he is trying to come to terms with the fact that he is currently on pace to finish the season with a Blaine Gabbert-esque 44-percent accuracy. While The Informer agrees Gabbert-like picks are unacceptable, it needs to be pointed out that “The Question” actually found a way to be even worse by only picking 41-percent of his games correctly. In other words, both of our picks have been “Tebow-awful” this year. Seriously, a former WWE wrestler who allegedly used to have a major crack-cocaine and drinking problem could pick NFL games better than us this season. The fact that “The Question” is currently 1-9 picking Thursday night games you can see why he would send The Informer a text asking if he can stop making his terrible picks. Unfortunately for “The Question”, when we signed up to pick every NFL game ATS we signed up for the good, the bad, the ugly and the horrendous (our picks). This means that no matter how laughable it is for two guys who obviously know nothing about NFL picks, to keep giving their advice on NFL picks –we must continue on. That is why this past week The Informer kept telling his partner the best way to move on was to have just one prediction go our way. Once we were able to get one thing right, our picking mojo would start flowing in the right direction. Mainly The Informer told him as long as we didn't stop believing in what we were doing, eventually the tides would turn. Well, Monday night while watching NBC’s The Blacklist (starring the great James Spader), we finally caught our break. If you have not watched The Blacklist yet, but plan to in the future; please skip the next few paragraphs. The Informer will make it clear when the SPOILER-ALERT is over. SPOILER-ALERT . . . SPOILER-ALERT . . . SPOILER-ALERT! Anyways, The Blacklist is a show about Raymond Reddington (Played by Spader) one of America’s most wanted fugitives who turns himself over to the FBI in order to help out a female agent named Elizabeth “Lizzy” Keen catch bad guys. Lizzy I am your father. Now back in September during the first episode The Informer told his wife the reason Reddington had turned himself in and continues to try and help agent Keen out is because just like Darth Vader –Reddington is her father. My wife (Scouts honor she is not a figment of The Informer’s imagination) told me there was no way this was possible since agent Keen already had a dad. The Informer told her that he knows how television works and he guaranteed Raymond Reddington is the father of Elizabeth Keen. The funny thing is; at the exact same time hundreds of miles away, unbeknownst to The Informer of course, a man named “The Question” made the same exact claim to his wife. Fast forward to last Monday when it was revealed to the world that Reddington was in fact Lizzy’s real dad and the only reason he turned himself into the FBI in the first place was so he could protect her from the bad people (Like her husband, but that is another story for another time). After The Informer watched Monday’s episode he immediately texted “The Question” to say he finally got a prediction right, to which “The Question” responded that he had made the exact same proclamation months before. SPOILER-ALERT OVER . . . SPOILER-ALERT OVER . . . SPOILER-ALERT OVER! So what does this have to do with Week 11 of the 2013 NFL Picks Challenge? Probably nothing, but after being right for the first time in what felt like decades The Informer started thinking of some of the positive things heading into this week. First of all, the Lion King Lock of the Week is back on track after winning two weeks in a row. Then there is the fact that the Thursday game features the AFC South leading Indianapolis Colts and Andrew "The Giant" Luck. For those new to this article, at the beginning of the season The Informer predicted the Colts would win the AFC South and that Luck would finish in the top five in the 2013 NFL MVP vote. After 10 weeks both of those predictions are spot-on. And finally, The Informer realized he still has seven weeks left to get over the .500 mark with his picks. I want everyone to know that The Informer is forcing me to make a selection for the Thursday night game even though I have been horrible all year long. Truthfully, I thought for a second I would be able to skate by without making a pick this week, but after hundreds of harassing and borderline “Incognito texts,” I caved and made a selection. I am reluctantly, and semi-against my will, taking the Indianlapolis Colts because even though home teams getting 2.5 points or less are currently 19-5 ATS on the season, Indy does not lose two games in a row. 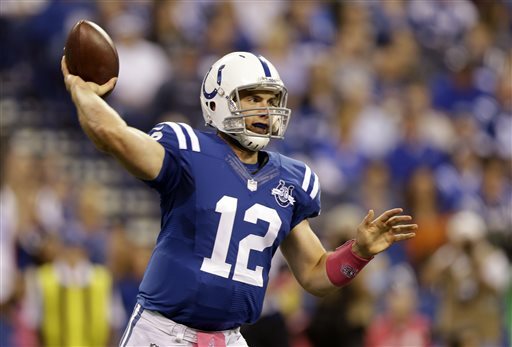 "The Question" is right: In fact since Luck took over as the Colts star quarterback, Indy is 7-0 after a loss. Also, Indianapolis is currently 2-0 against the AFC South this season, with both of those wins coming on the road. Tonight they are playing the Tennessee Titans, an AFC South foe, on the road. So, if history is going to continue to repeat itself, one would have to think Indy will handle their business tonight. Oh yea, The Informer almost forgot; Ryan Fitzpatrick is going to be the starting QB for the Titans after Jake Locker was lost for the season due to an injured foot. The Informer has no stat to go with that last sentence. He is just saying there is no way he is picking Fitzpatrick over Luck in prime-time. Get your “Andrew Luck Kool-aid” mugs ready, because The Informer is expecting a Thursday night Luck show to help him get back on track to his journey towards .500.